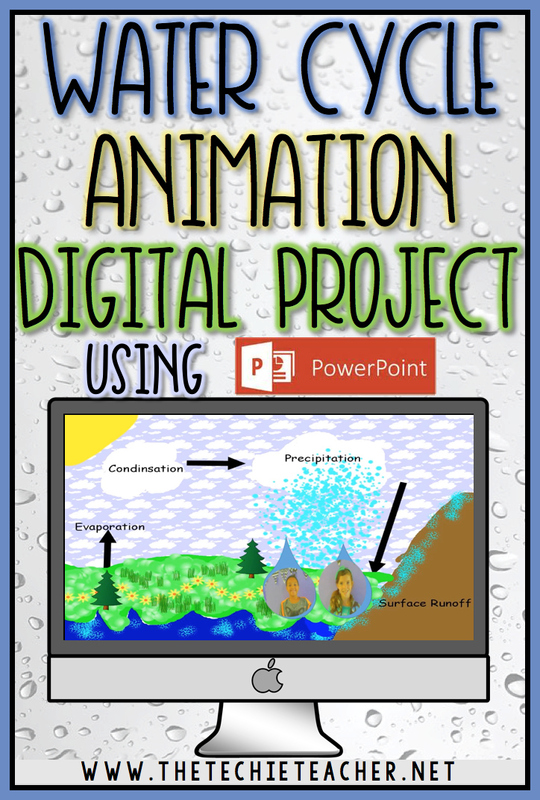 Water Cycle Animation: Digital Project Using PowerPoint | The Techie Teacher® . For the past two Thursdays I have been working on a really fun water cycle animation project with a 5th grade class. 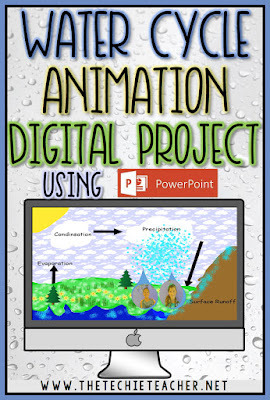 We used Pixie and PowerPoint to create an animation of The Water Cycle. The classroom teacher allowed students to choose if they wanted to work in partners or alone. Next, the students created a water droplet by using the shapes tool and/or the webcam to take a selfie and then cropped to shape. If students used both a shape and an image then they used the grouping tool to group the objects together. After the water droplets were created, we showed the class several options to animate their droplet so it would visit each phase of the water cycle. We used the custom animation path to accomplish this! Some students figured out how to add the entire animation on just one slide while others copied and pasted the slides to work around their animations. This definitely involved A LOT of critical thinking and problem solving! Finally, the students recorded their voice as if they were the water droplet telling what happens at each phase of the water cycle. Students exported their Powerpoint as an mp4 movie file and sent it to me via the Work Collector. I uploaded the videos to my Vimeo account and pasted the embed codes into a shared Google Doc. This class has their own blog that each child publishes posts/work to s they copied and pasted their embed code from the shared Google Doc into a post to share with the world! Rachel and Reagan's Water Cycle from Julie on Vimeo. Clara's Water Cycle from Julie on Vimeo. Seth and Wyatt's Water Cycle from Julie on Vimeo. Hi, Julie. Is there anyway we can see one of the kid's videos? We're thinking about having the students create these and show their parents at Open House. Thanks! Hi there! Thanks for posting--apparently I let my Vimeo subscription run out...eek! I just renewed it and the videos are showing within this post now :) Hope you all have as much fun as we did with this project! These videos are great! Thanks for sharing this idea!